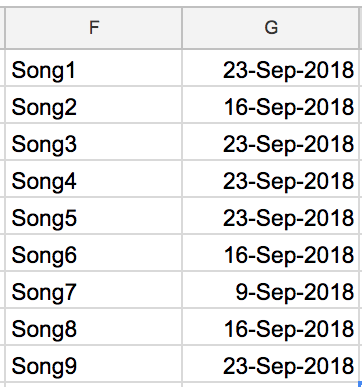 I am trying to automate Worship list using Google Sheets, so it works good but one thing I can't do can be more than useful. in row 1 dates and below songs used that Sunday. MATCH works good with one column, but how can I do it with multi-column range? I created a sample sheet from your data, with a few more columns. Basically, I took raw data, and added another row immediately underneath the date header. This new row contains =JOIN(";",A4:A9), and is copied to each cell in the row. D12 contains "Song1" in this case. A2:G3 contains the dates and the songs joined together. I'm sure there are better methods to accomplish what you want, especially ones which don't require copying multiple formulas to a lot of cells. I just did this as a quick proof of concept. How to make a simple two column data chart in Google Spreadsheets?